EMM is thrilled to announce that Sheku Kanneh-Mason, winner of BBC Young Musician of the Year 2016, has signed an exclusive recording deal with Decca Classics. This major new record deal will provide long-term support to the vibrant young classical star as he embarks on the next stage in his studies and help nurture his flourishing musical career. A local hero in Nottingham, Sheku signed his record contract on board his very own bus! 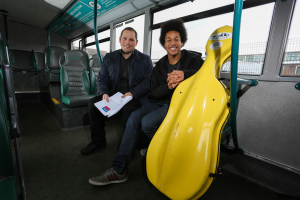 The City Council named it after him following his BBC Young Musician triumph and the route includes a stop for his school, Trinity Comprehensive. 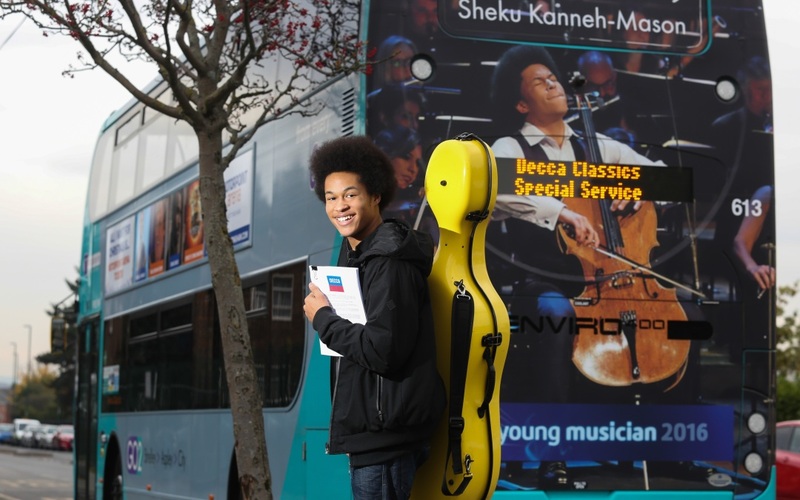 To kick start Sheku’s new partnership with Decca Classics, he will record Shostakovich Cello Concerto No.1 – the piece which saw him become the first black winner of BBC Young Musician of the Year, in a performance which was described by judges as “electrifying, sincere and moving”. Sheku comes from an incredible musical family in which all six of his siblings (he is the third child of seven) play instruments to a phenomenally high standard – yet neither parents are musicians. Simon Cowell called them “the most talented family in the world” during a performance on TV’s Britain’s Got Talent. Every spare penny goes into the children’s musical education, from lessons, buying sheet music and instruments, to re-hairing bows and re-tuning pianos. Every Saturday, Sheku wakes up at the crack of dawn in order to catch the train to London to attend the Royal Academy of Music’s Junior Programme. He uses the journey to catch up with his A-Level homework. However Sheku still finds time for his other hobbies – he enjoys football, table tennis and listens to a wide range of music from Bob Marley to Mozart and Mahler. Sheku began to play the cello at the age of six, after attending a concert in Nottingham. By the time he was nine, he had achieved Grade 8 and earned the top marks in the country. Since then he has won numerous awards, including the Royal Philharmonic Society Young Instrumentalist Prize. Sheku will make his first Decca recording next year, but before then this sensational young cellist can be found playing in concerts halls around the UK and further afield – with many solo and concerto performances lined up which are sure to mesmerise and enthrall.